The Expendables 3 isn’t a good action movie or a bad action movie. It’s simply an action movie, one that clings to the traditional formula so tightly it could serve as a template. We walk away from it feeling neither excited nor disappointed. We just walk away, no better or worse off than when we went in. With this in mind, and because the point of any movie is to impact the audience in some way, hopefully positively, The Expendables 3 is ultimately unnecessary. If you merely need an action movie fix, then I suppose it gets the job done, but given the cast and budget, and today’s movie theater ticket prices, shouldn’t our standards be higher than just “gets the job done”? If you’re up to speed on The Expendables franchise, then you know it follows a mercenary team that tackles our nation’s “dirty work,” which means going into war zones, taking out foreign enemies and conducting rescue missions. 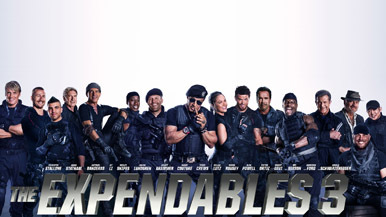 This being a Hollywood action movie and all, each of the Expendables’ assignments also requires that they blow a whole bunch of stuff up and perform death-defying stunts, all while making jokes and delivering cheesy one-liners. The group is mostly comprised of tattooed, muscle-bound, gun toting tough guys - and one woman in this case - and features a lineup of action stars from the past three decades. Joining the gang of Sylvester Stallone, Arnold Schwarzenegger, Jason Statham, Dolph Lundgren, Randy Couture, Terry Crews and Jet Li are some people you may have heard of and others you may not have: Wesley Snipes, Harrison Ford, Mel Gibson, Kelsey Grammer, Antonio Banderas, Glen Powell, Victor Ortiz, Ronda Rousey (she would be the one woman) and Kellan Lutz. The movie doesn’t allot any time to develop the characters beyond their specialty, be it guns, knives, mountain climbing, boxing, mixed martial arts, dirt biking, parkour, etc., but rest assured, it does give them the opportunity to show off their skills during the big climax. The plot, if there was ever a clothesline one, finds the Expendables on a mission to seize an international arms dealer named Stonebanks (Gibson), who just happens to be a former Expendable turned dark. He’s been selling weapons to warlords and gangs across the world and has made billions doing it. When Barney (Stallone) and his good guys team are nearly decimated trying to capture Stonebanks, Barney decides it’s time for his crew to retire because they’re just too old for this sort of thing.